Claudia Bielefeld was educated at the University of Cologne in hearing-impaired and special pedagogy. She graduated in 2007 with a Bachelor’s paper on ‘Phonological Awareness in Hearing-Impaired Children in Special Schools’. Between the commencement of her study in 2003 and 2015, when she completed the intensive course on sign language at the Stegen Education and Counseling Center for the Hearing-Impaired, she attended more than seven courses on the subject in German centers of excellence for educating special teachers. In 2008-2009 she had a clerkship at the Stegen Center and the special school in the Hochschwarzwald therapy center, focusing on systemic counseling in early education for hearing-impaired children. 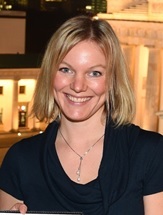 In 2009-2010 she worked as audiologist and teacher at the Hearing and Speech School of the Basel canton in Switzerland, with a primary stress on bimodal teaching and single-point integration. Claudia did a brief stint as special teacher in Ried, after which in 2010 she conducted a course on creating a system for training teachers on incorporating sign language into school routines with hearing impaired children. Since 2010 she holds the position of special teacher at the Stegen Center. Additionally, she is a member of the executive council of the trade union of German teachers of the hearing-impaired in the federative land of Baden-Württemberg, and since 2013 Associate Professor in sign language at the Freiburg Catholic High School. She chairs countless other projects and currently lives in Freiburg. Whenever Claudia gets time off work, she spends it travelling, jogging, kayaking, speed cycling, reading and cooking.